VMCoolumns - An original logic game with simple gameplay. 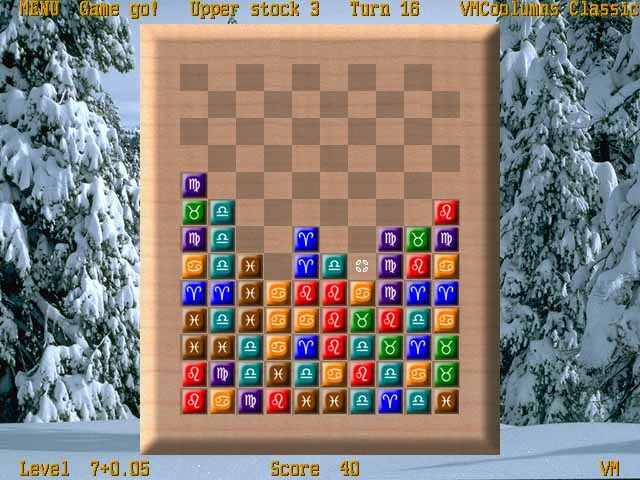 VMCoolumns is an original, new type of logic game. The game has simple and absolutely clear gameplay. You will find five entertaining episodes and a set of various and progressively more difficult skill levels... So, VMCoolumns starts with demure and seemingly quite safe for your own time (the worst mistake!) VMCoolumns Classic where chips do their best in climbing upwards along vertical columns and you're hard pressed for the living space... One cannot describe in words the depth of this whirlpool called "VMCoolumns", the power of its addictive challenging stream, logical perfection of each episode and their maturity playability - you must try it yourself!